We've helped thousands of small businesses get found online with affordable website design and development. Can I just design my own website? Imagine turning 85% of your current customers away. If you don’t have a website, that could be what you’re doing. 85% of local consumers are searching for businesses like yours online every single day. 78% of those potential customers will research a business online before deciding to purchase. If your business is missing a great website, you are missing out. At BizIQ, our website design services make your business the first choice for local customers searching online for the products and services you offer. Whether you’re just opening your doors, or you’ve been in business for 50 years, our small business website design and development services can help you reach new customers, build your brand, and generate positive growth. Our websites are built on the rock solid foundation of years of research in conversion optimization, user experience, and design theory. They are beautiful, easy-to-navigate, and flexible while also being powerful, lead generating machines designed to drive and sustain the growth of your business. By 2019, mobile traffic will increase by 480% over desktop traffic. Responsive web design means that your customers will experience a fully-functional, intuitive, and impressive website no matter what kind of device they’re using. Before your customers can find your website online, search engines like Google need to find it and rank it. That’s why every website we design comes with a solid search engine optimization (SEO) strategy built in. The end result? Better rankings, increased visibility, and more customers to your door. Your website is the cornerstone of your online presence, but it won’t be working alone. The results you will see each month are driven by a multi-faceted approach to small business online marketing. Our comprehensive solutions combine the best in search engine optimization, local search marketing, reputation management, copywriting & content marketing, and more. Everything BizIQ does is geared towards making your small business the first option for local customers seeking the products & services you provide. If you already have a website for your business or you’ve been trying to find a company to design one for you, you’ve probably discovered that it’s virtually impossible to find any up-front pricing. Everyone wants you to talk to a salesperson and sign a confusing contract and even then use gimmicks and tricks to hide the real costs. In many cases, they might even be hiding things like who owns your website’s content and domain in the fine print. BizIQ is different. That’s because transparency is one of our core values and that includes being upfront with how much your website will cost. In fact, we publish our prices right here on our website, never require you to sign any contracts, you pay month to month and cancel at any time. What’s more, you own your website which means you will never have to worry about losing your website or domain. What are the benefits of professional website design? It’s always been an accepted truth in business that you need to reach your customers where they are and in our digital age, your customers are no longer searching the phonebook or relying on word of mouth recommendations from friends to find the products and services they need. If your small business isn’t online, it’s invisible. That’s why to be seen, your company must have a website. But being found online isn’t enough. Your small business website needs to stand out from your competitors and to do that requires knowledge and experience in developing and designing websites for small businesses like yours with local online marketing in mind. At BizIQ, we use the same tools to design and build a website for your business that we use to create our website. We’re a small business too and we believe that your business deserves the same high quality, professional website design that the larger companies get, but at a fraction of the cost. Why can’t I just design my own website? You can, but are you confident it will get found online? You’ve probably seen the clever advertising campaigns and entertaining commercials from some of the DIY website design companies that feature celebrities sharing how simple and quick it was for them to design and launch a website for their business themselves, no designers or developers required. Those videos make designing a website look easy, but it’s not. There’s more to online marketing and website design than choosing templates and sharing your vision. To show up in search results and build a website that gets customers to call you or visit your business you need to understand how to do more than just piece together a pretty picture. You need to understand search engines, user experience, and how to create websites that look great on any size screen from the smallest smartphones to the largest desktop monitors. 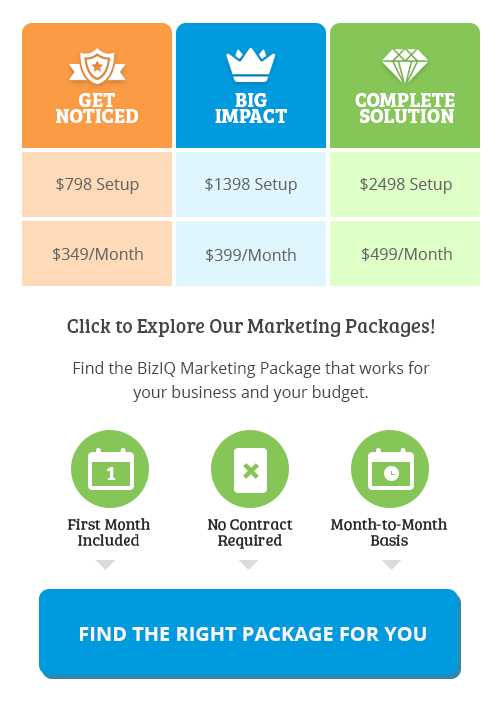 At BizIQ, we’ve made it our mission to ensure small business owners just like you can have a website using the latest technologies and state-of-the-art techniques while keeping your costs low. Your business wasn’t made with a cookie cutter, do you really want a website made from the same templates your competitors have access to? Is professional website design right for your business? Yes, of course! If your business is small or just starting up, you might wonder if a professionally designed website is even within reach. You really don’t have to sacrifice having experienced digital marketing professionals design your website or settle for a do-it-yourself website from a template. In reality, with a little help from the professionals at BizIQ, your business can have a gorgeous website that shows up in search results and that your customers will want to visit that fits your budget. Whether your business is small, medium or large, a well-designed, fully optimized website is an essential online marketing strategy. Your customers are searching for your services online and if your business doesn’t have a website, you’re missing out. Even if your business has a Facebook page, you still need a website so customers can find you. Social media profiles alone, aren’t enough and your business can definitely benefit from the marketing boost that only a professionally designed website can give it. Absolutely! Recent studies show that at least 85% of consumers base their opinion of your business’s credibility on whether or not it has a website. If your small business isn’t online, you could be putting customers off by making your business look like it doesn’t know what it’s doing. But it’s not enough to just have any sort of website. That’s because nearly 90% of consumers say they would probably not visit a business’s website after a bad experience. With website design and development services from BizIQ, you never have to worry about poor user experiences. Here at BizIQ, we understand small businesses because we are one ourselves. Our skilled website developers and designers will provide your company with a professional website that’s mobile responsive and that will get found online and will bring you customers so you can grow your business. The truth is, online marketing is constantly evolving and your website needs to change to stay ahead of the curve. Even if you already have a website, BizIQ can still help. Whether you ultimately decide to keep some of your existing content or we help you design a completely new website, we can walk you through the transition process and you can still take advantage of all of our website design packages and other online marketing services. How to get started with website design? We think your business deserves the same high-quality digital marketing and website services that the big companies get, but made affordable for small business owners. You just have to take the next step and call us to set up your free, one-on-one digital marketing evaluation and competitive analysis. We’ll address all your concerns and answer all your questions about pricing and lay out a plan for how a professionally designed mobile responsive website can help you grow your business. No pressure. Just smart local online marketing solutions. 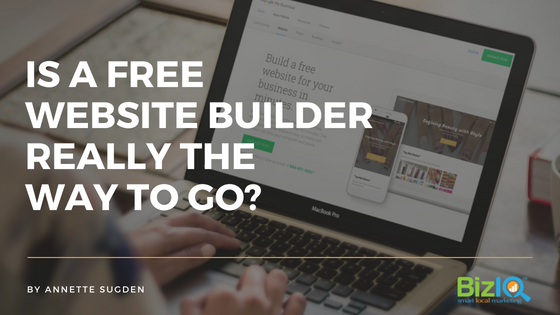 Should You Use the Google Sites Website Builder?